FintechBot: What, why, how and what next. In order to get around my own laziness I built a bot to do my work, well a tiny bit of my work. 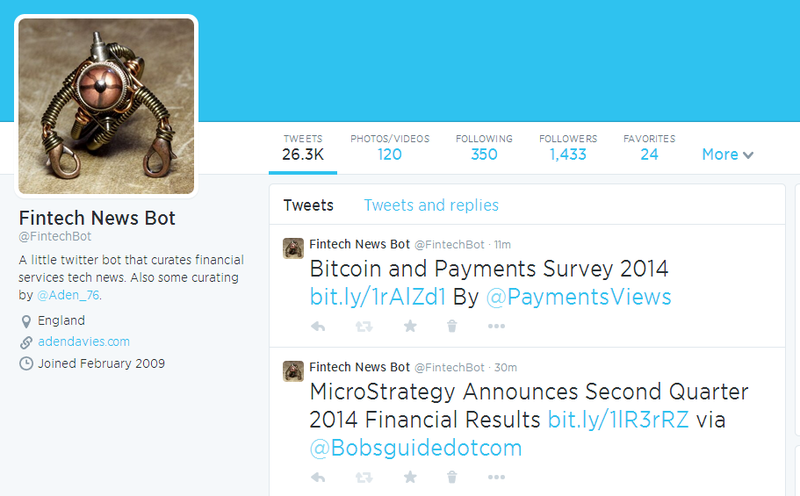 FintechBot is a very simple Twitter bot that collects fintech news stories and tweets them for the world to see. It has saved me time and it seems to be fairly popular with other lazy fintech newshounds (Around 1400 followers at the time of writing). A few people have asked how it was built so this post is just that so you can go and build your own little news bots. I have also written about how I would like it to improve it in the vain hope someone can help me do that to get around my laziness yet again. It really is a very simple thing. It was inspired by my colleague Richard who built an NFC Banking bot and a wildly successful Future Lighting bot (lots of lamp nerds out there). He chose to power them using Google Alerts and a mixture of trusted sources. I collated a set of trusted tech and financial news sites (a list of which can be found here). I then took the RSS feeds from those sites or elements of them e.g. 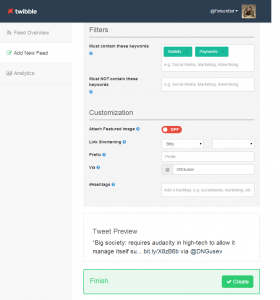 just a blogging section of a news site, and added those as fuel to an auto tweeting service. At the time of creation (just under 3 years ago) there were two notable services for autofeeding a Twitter account, Twitterfeed and Dlvr.it. 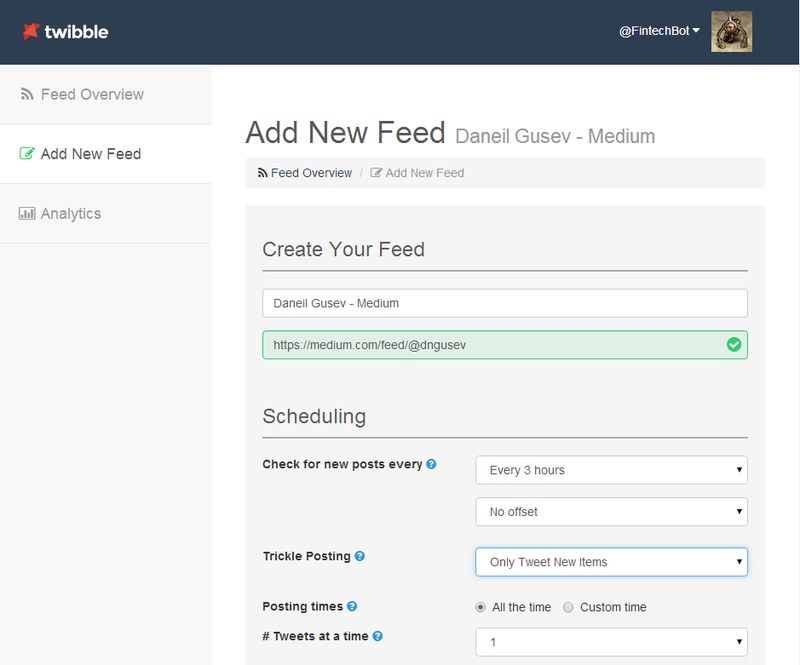 A new service has recently appeared called Twibble.io that looks very promising which I have recently started using following a price hike for Dlvr.it. At some point I may migrate fully (see laziness comment above) The latter has some useful interface benefits and more powerful (and working) filtering capabilities than Twitterfeed. Dlivr.it still has some winning features such as route level filters…more on that later. How do I set up my own? Essentially you do the following. 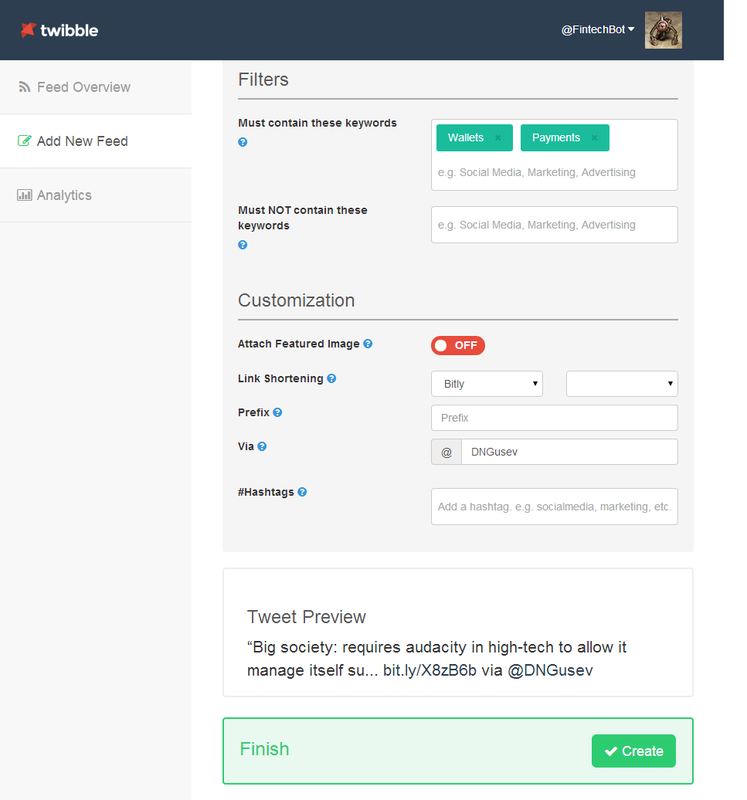 I will step through the addition of one feed to a Twitter account using Twibble.io Go to Twibble.io. Give it an output schedule eg only post one item per hour and the frequency to check the RSS feed for new posts. For single blogs no need to check that often but for news sites the more frequent the better You can choose to offset the posting from when it finds items. You can also choose whether to post old items or only new items on the feed. I choose the latter You can then choose to filter the stories that get posted. For tech news sites I have a long list of filter terms such as banking specific terms like payments, wallets ATMs etc and also the names of companies I am interested in tracking e.g. PayPal, Visa, Square etc. You can also choose not to post based on mentioned words so if the word Banks appears near to the word Tyra don’t post. Some sources I post unfiltered as their output fits in perfectly with the news I want such as Daniel Gusev’s fine fintech blog used in this example. And that is it you have created your first automated Twitter feed. I do also manually share items via second Twitter account services in both Tweetbot and Tweetdeck but I am sure you can work those bits out your self. If you want to use Google Alerts for your news then go there and create an RSS feed and just add in the RSS URL to the steps above. One of the side effects of creating this bot is that it gets followed by some very interesting people in the Fintech world. A good mix of experts, commentators, journalists and developers. This has helped me expand my research network immeasurably as well as source interesting new feeds and angles. Another side effect has been that Twitter’s follower recommendation algorithms are really pretty good when aimed at a very single purpose Twitter account so the suggestions made are usually useful which is another unforseen bonus. What I would like improved? 1. Filtering options of delivery services. I would like to see some global list capability I.e. A list of filter words that gets applied to many feeds. Dlvr.it does this quite well as it allows you to group a selection of feeds into a route and then apply a global filtering list to the group of feeds. Dlvr.it’s new restrictive pricing models mean I can no longer make use of this. Come on Twibble.io make it happen. What I would really like is the ability to save multiple filter lists and assign each a name. Then apply the named groups/s to a set of feeds.That way I can edit a global list of filter terms once and it would apply to all feed assigned that group. Sounds easy to me (who can’t program to save his life). Today if I want to add, remove or amend a term it means I have to edit that list for every single feed, this is onerous and manual and a lazy person hates that. 2. More sources! I need more decent news sites. More fintech bloggers of note. More hot startups and trends to track. All suggestions welcome. I am currently tracking around 60 sources but I welcome many more especially from outside the US and Europe which seem to dominate at the moment. 3. Geography/business. I would love to be able to somehow split by region or by business e.g. investment banking, So maybe a fintechbot Asia. Hard to do without manual effort. If anyone has any ideas other than local sources and search terms I would love to hear them. I am giving thought to making some separate FintechBot accounts that concentrate on one element eg payments or Bitcoin/altcoins. Not decided yet. 4. I have created a summary of FintechBot output into a daily email (subscribe here) and I am also automatically feeding them to my blog via Postie and Mailchimp. I would like some way of picking the ‘best’ news from the day. Not sure how best is quantified but most clicked/shared/repeated by other sources could be good. Any suggestions greatly appreciated. 5. Cross the firewall. We have experimented getting this news inside the org I work for. I would like to do much more but once inside the firewall tools become a bit more limited…thankfully I have a very talented colleague who builds some fantastic tools to assist with this. The key is how to filter for business area and manage subscribers internally. A challenge for the year ahead. 6. A decent searchable archive. I do plug all tweets into delicious but I don’t do much with it at the moment. I use Tweetnest for my personal tweets but have yet to work out how to create a second Tweetnest account on the same web server. 7. A better twitter avatar. I would like to get a smart illustrator to draw a real fintechbot. The current image is actually a ring (similar ones available here). I am currently investigating this with another talented colleague of mine (Please reply Matt). If any illustrators read this (very doubtful) or people have any suggestions, or want to submit a drawing then do let me know. Maybe I should make it a competition? Or maybe I should just pay someone. So there you have it. Hope someone found that lot useful. Any questions then leave a comment or ask me or my bot on Twitter.